Scott Scout Multi-Gas Meter | Enviro-Equipment, Inc. The Scout's advanced design incorporates some of the most advanced engineering you can find in a portable gas monitor. The Scout was designed so that every level of operator can pick it up and use it. Scout's built-in intelligence means that both basic and sophisticated operations are simple and intuitive. Built-in flexibility means that Scout is configurable to operate in YOUR application. • Switch between free-air (ambient) mode to sample draw mode with just a push of the IntellishutterTM button. • No tools lock and latch battery replacement. • Safety port only permits sample probe connection when Scout is placed in sample draw mode. Scout's Advanced Battery Management (ABM™) Technology can provide over a typical work week power on a single battery pack! Quickly change from diffusion mode to sample draw mode "on-the-fly" without tools. Shutter position is sensed to prevent incorrect operation. Sample draw port only permits a probe to be connected when the shutter is closed. Easy to use for both the basic and advanced user. Scout's userware can be configured for any level of user and stores up to 100 customized profiles for your teams. Optional integral pump permits samples to be taken from up to 100 ft away. 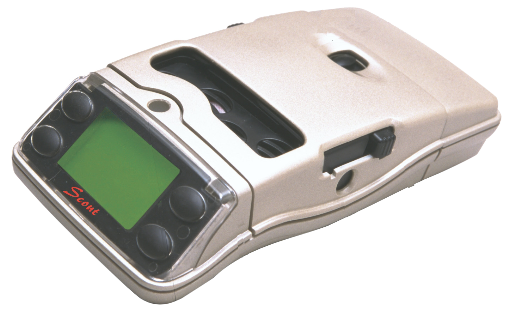 Electronically integrated with the IntelliShutter™ to automatically begin operating upon shutter closure. Special low flow alarm sensing, automatic pump shutoff, and water blocking filters combine to protect the Scout from water damage. Drop it. Soak it. Trust it. Dropped tested to a concrete surface and submerged in water, Scout continued providing safe gas detection - without interruption - without failure. Convenient, no tools required battery swap-outs. Hydrogen Sulfide detection are combined into one cost efficient sensor. With three additional sensor ports available, the Scout can detect up to 5 gases simultaneously and, unlike other multi-gas instruments, all five can be toxic sensors. Sensor end-of-life indication provides advanced warning of sensor replacement time. "Instant recovery" feature eliminates sensor warm-up time so sensors work immediately after a battery change. Auto-ranges to % gas above 100 % LEL. Advanced configuration capabilities include data tagging, datalogging and exposure record keeping, and auto calibration. Direct reading air-free Carbon Monoxide monitoring capable. Both the Alkaline and Lithium-Ion battery packs deliver power to the Scout for over 50 hours. "Old technology" batteries could loose their charge during extended storage periods or develop a "charge memory". Scout's batteries were specifically chosen to retain their charge over an extended storage period, and with Lithium Ion technology, no charge memory is developed. 7 1/2 x 2 5/8 x 4"